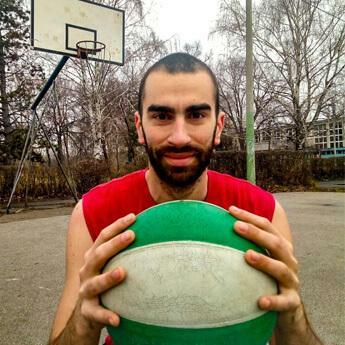 Will you have a better playing career if you are the shortest or tallest NBA player? It seems logical that the game played "above the rim" should be more suitable for the "giants". However, we did an in-depth analysis of players who led the league in height and their colleagues on the other side of the scale. 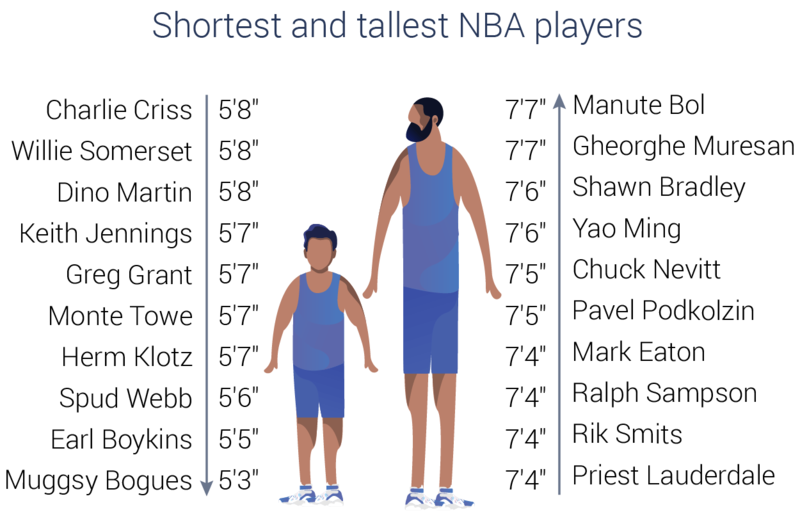 It turns out that, unless your name is Wilt Chamberlain or Kareem Abdul-Jabbar, tallest players are not more successful than their shorter fellas. In fact, their careers are very comparable. Over the past 72 NBA seasons, 18 different players had the tallest NBA player title, while 19 names have been on the other side of the height scale. We're dealing with 37 basketball players as the leaders of the NBA height extremes. 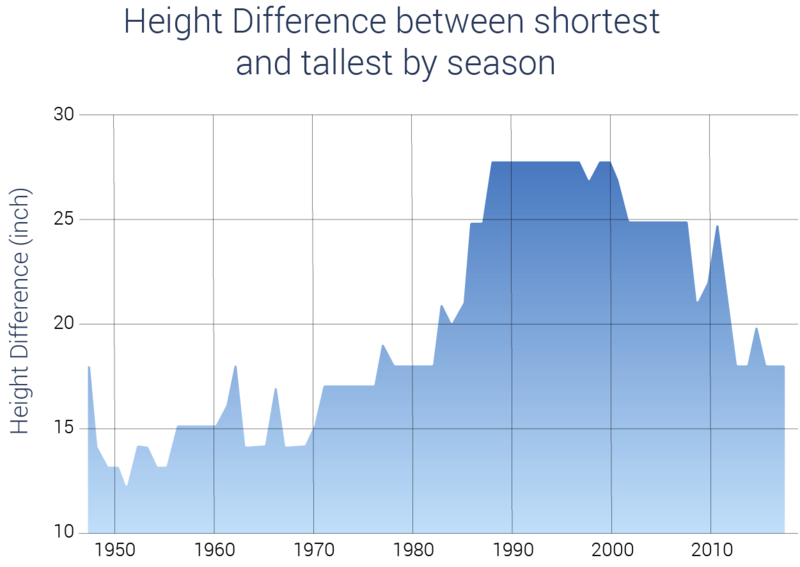 Changes in shortest and tallest players height have been following the evolution of how the game is played. The gap between the two groups was steadily growing until the 80s and then took a steep rise during the next decade. The gap started to narrow down during the first decade of the 21st century, followed by an even faster decline over the past 8 years. 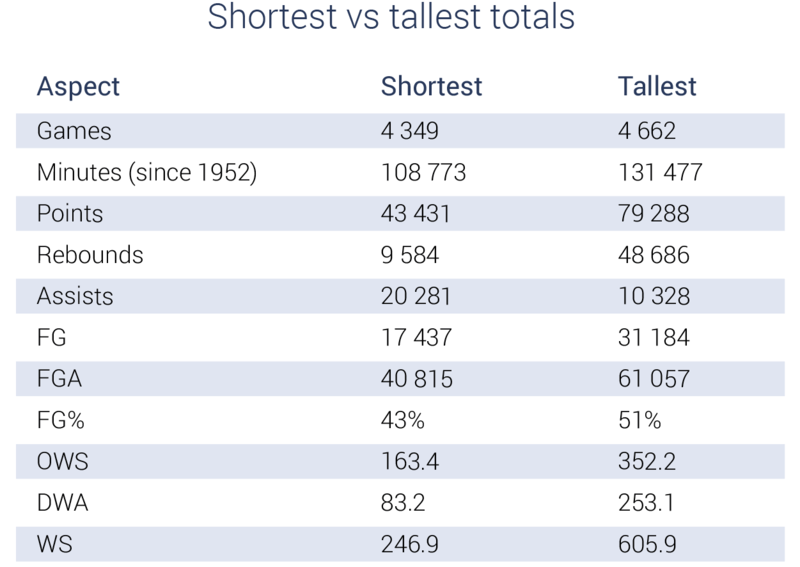 Last season, the gap between the shortest and tallest player was the smallest in the last 30 years. We can expect this trend to continue in the future, as we're heading towards "positionless" basketball. With the introduction of the 3-point line, the focus of the offense shifted from the paint to the perimeter, making the job very hard for the tallest players. 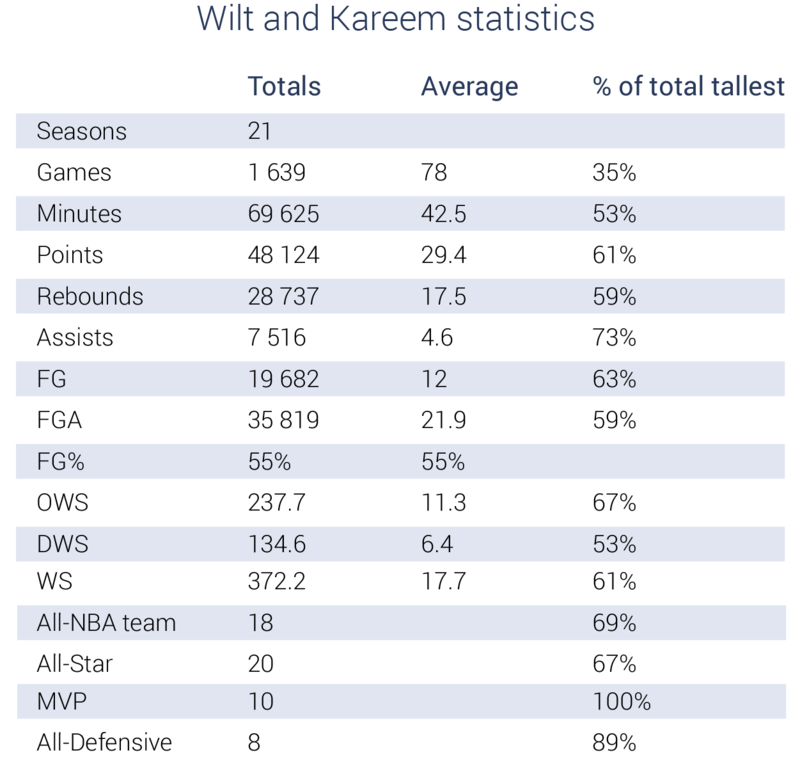 We can say that Kareem was the last dominant tallest player in the league. Yao Ming had a good run, but it's interesting that his shooting percentages from the mid-range were better than from the paint. Nowadays, there is not much room for the giants in the NBA. Boban Marijanovic, the tallest active NBA player, has an insane efficiency but averages only around 10 minutes per game. On the other hand, even though he had struggled with injuries, Isaiah Thomas is also facing a reduced role in the team. One of the main MVP candidates just a couple of seasons ago is facing a huge problem, as guys who are guarding him are also getting taller and stronger. The stats are not a surprise. Basketball, especially the NBA type of basketball, is a game played above the rim. It's logical that the shortest players in the league are making a much smaller impact on the game. On the other hand, just two players from the list of the tallest take most of the credit for their supremacy. But we'll get to that later. The only aspect dominated by the shortest players is in assists. 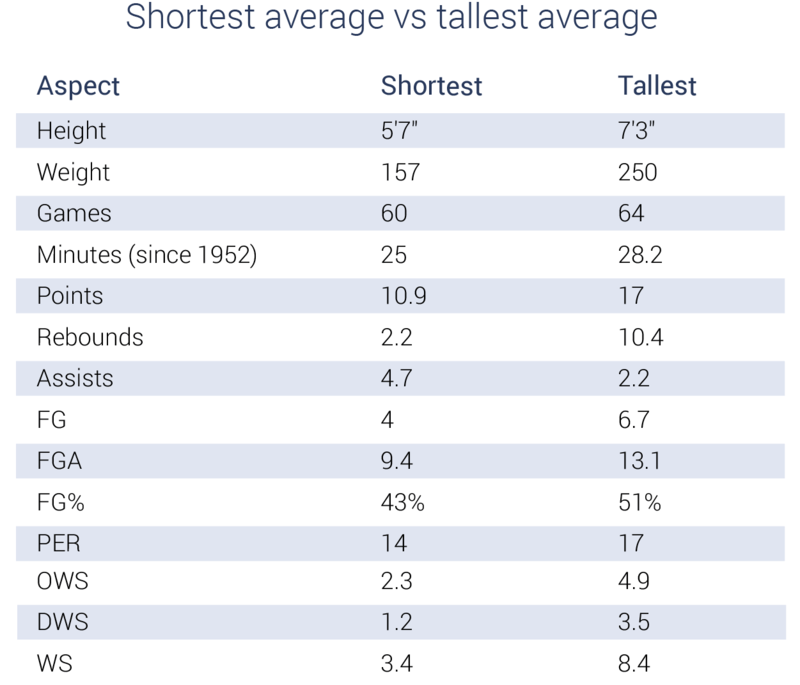 For about the same number of minutes spent on the court, the prototype of the average tallest NBA player would average 6 more points and 8 more rebounds per game, while shooting 51% from the field, as opposed to 43% by his shorter colleague. The difference is also evident in Win Shares, both offensive and defensive. As the number of total games played and the number of minutes spent on the floor by both groups is nearly the same, these stats are pretty much valid. After this comparison, the gap is even wider. 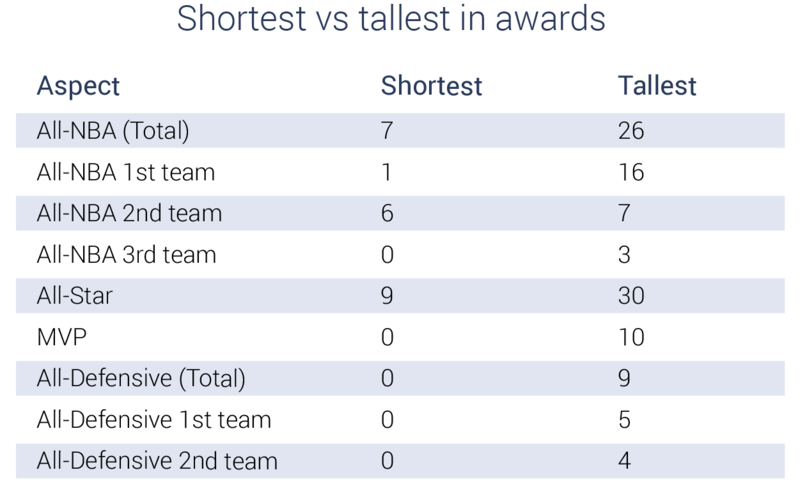 But during the 72 years of the NBA, only the 3 shortest and 5 tallest players are deserving of all awards. During the 50s, a 5'10'' Slater Martin was a 6-time All-Star and 5-time All-NBA second team member. Ralph Beard, also 5'10'' guard, added another All-Star appearance for the group of shortest, along with All-NBA first team honor. Until Isaiah Thomas' two All-Stars and one All-NBA second team a couple of seasons ago, no other shortest player got any of the NBA awards. It's nothing different for the group of the tallest guys, neither. We'll show you in the graphic below how much Wilt Chamberlain and Kareem Abdul-Jabbar contributed. Aside from them, George Mikan (3x All-NBA first team, 1x All-Star), Manute Bol ( All-Defensive second in 1986), and Yao Ming (8x All-Star, 2x All-NBA second team, 3x All-NBA third team) are the only players from the list of the tallest with some of the NBA awards under their belt. 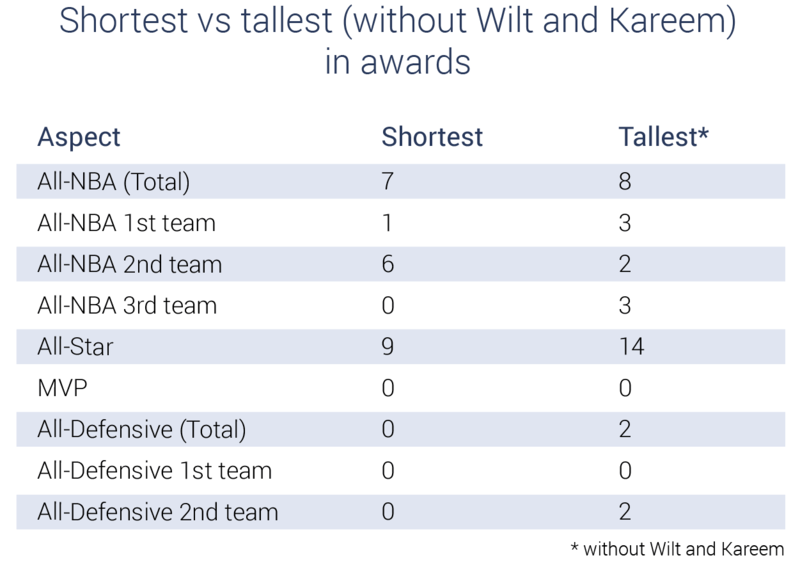 We've already mentioned a couple of times that two players take the most credit for the dominance of the tallest players over their shortest compadres. Wilt Chamberlain and Kareem Abdul-Jabbar dominated the NBA for 20 years as no other players have done before or after them. While playing only 35% of the total games and 50% of total minutes, these two NBA legends scored 60% of the total tallest players' points. They grabbed 60% of the rebounds, dished 70% of the assists, and collected 60% of the Win Shares from the group. Looking at the awards, their impact is even greater. Wilt and Kareem combined 10 NBA MVP honors, along with 20 All-Star, 18 All-NBA, and 8 All-Defensive team selections. It's easy to beat the shortest players group when you have two of the best players in NBA history in your team. Without Chamberlain and Jabbar, it turns out that the difference is almost insignificant. Both groups are also comparable in practically every aspect. 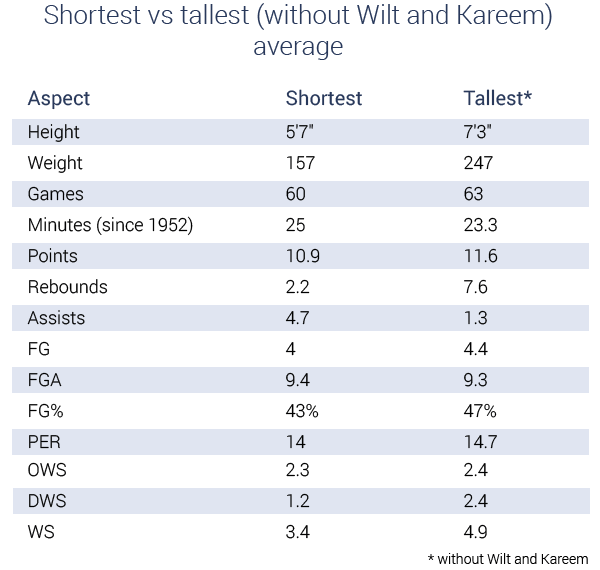 Even though the number of 7-footers increased during the 80s, influenced by Wilt and Kareem, they never made the same impact on the game, not even close as those two legends. In the end, as all these figures show, it seems that there's no big difference whether you're the shortest or tallest NBA player. 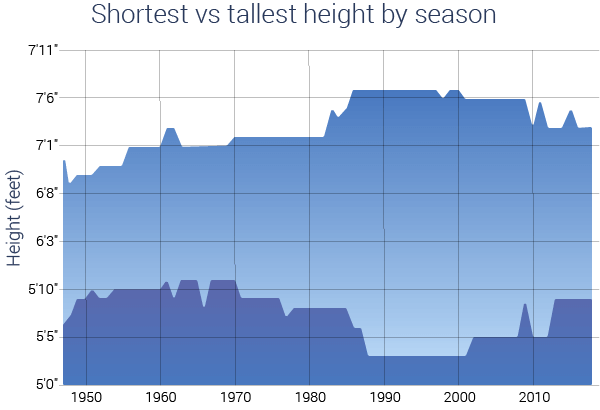 After all, the NBA is not a place for height extremes, at least not for a long time. At RunRepeat, we value quality over popularity. Our CoreScore rating system helps you pick the best basketball shoes while taking care you have the best available price. Our experts are spending countless hours collecting every user review on the internet, making sure you have all the relevant information to choose the best model for you. We are also devoted to making quality, in-depth articles in all of our categories.